The Energy Department’s SunShot Initiative has met its goal of reducing solar costs and may expand its focus. Ceramatec Inc. Updated at 2:25 p.m. EDT. With its 2020 target of seeing costs drop achieved, the SunShot Initiative said it will also look to "critical challenges" such as fortifying the electric grid. The grid reliability issue has long been at the forefront of DOE's agenda, but even more since last month's release of a study examining energy subsidies and factors driving retirements of coal and nuclear plants. "Our plan is to focus on the administration's priorities of early-stage research to address solar energy's crucial challenges — grid reliability, resilience, and storage," said Dan Simmons, head of the Office of Energy Efficiency and Renewable Energy (EERE), in prepared remarks set to be delivered today at the Solar Power International conference in Las Vegas. "The hurricanes, the earthquake in Mexico, demonstrate the necessity of resilience," said Simmons in the remarks obtained by E&E News. 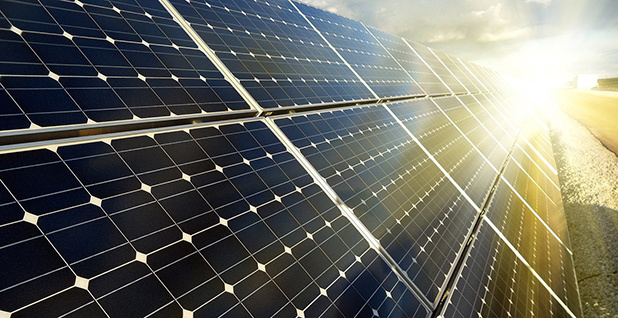 DOE launched SunShot during the Obama administration to make solar power more cost-competitive. SunShot set that 2020 cost target years ago, and the industry had only achieved 70 percent of it as of last year. Research released today shows that utility-scale solar costs have plunged to 6 cents per kilowatt-hour three years ahead of schedule. "It's important to celebrate the progress we've made, and be realistic about the challenges that lie ahead," Simmons said. "Solar's costs have dramatically declined, but electricity rates have not. As we experience greater penetration of solar [photovoltaics], we experience new challenges," he added. In a brief interview after his speech, Simmons said he was not concerned about proposed budget cuts moving through Congress that could slash funding by half for EERE, which supports SunShot. "The budget proposal was a starting point. It will take direction from Congress," he said. While the program is planning for different budget scenarios, funding levels have not yet been affected, he said. SunShot leaders — pointing to a new National Renewable Energy Laboratory report — said technology improvements and the rapid decline in solar module costs helped companies reach the target early. They touted efficiency improvements in the manufacturing of silicon wafers. As part of its expanded 2030 focus, SunShot announced $82 million in grants for early-stage research in concentrating solar power (CSP) and power electronics, which help grid operators protect against challenges like cyberthreats. DOE said Congress has already appropriated the money. Awardees will have to contribute 20 percent of funds to a project, meaning that overall public and private spending could reach $100 million. Of the money, $62 million would be slated for advances in CSP technologies, which use mirrors to reflect and concentrate sunlight onto a focused point, often in combination with molten salt storage. DOE has supported some of the largest solar thermal projects in the world, including BrightSource Energy Inc.'s Ivanpah plant in the Mojave Desert. "CSP can provide peaking power, but with the incorporation of thermal storage, can also provide base loadpower, at any time of day. This means CSP has the potential to provide dispatchable solar power to the grid," Simmons said in his prepared speech. He also announced a third funding opportunity of up to $50 million for the national labs, to pay for early-stage research to improve resilience in energy infrastructure. SunShot said it will continue to focus on reducing costs for residential and commercial solar, which have not yet reached desired goals, partly because of soft costs such as installation and permitting. The target for residential solar is 5 cents per kilowatt-hour by 2030, and costs currently are about double that. Today's announcement comes as uncertainty hovers over the solar industry because of a trade case before the U.S. International Trade Commission that could slap tariffs on imported solar modules and — as opponents see it — undermine cost reduction goals. Simmons said DOE is not taking an official position on the case. President Trump may end up deciding the issue later this year if the ITC concludes this month that solar companies Suniva and SolarWorld experienced injury because of a flood of cheap Asian imports. The case is opposed by a broad swath of groups ranging from the Solar Energy Industries Association to the conservative Heritage Foundation. Today, several conservative groups, among them the R Street Institute and American Legislative Exchange Council, sent a letter to the ITC warning that tariffs could double solar prices and lead to retaliation from trade partners. On the other side, the Steel Manufacturers Association sent a letter in support of tariffs, saying it is troubled by the "devastating impacts" of job losses and bankruptcies because of cheap imported components.